A while back, I was braving the cold weather out in Wisconsin and meeting up with friends and family at a new spot in downtown Madison for dinner. There are a lot of great food things that Wisconsin does right – cheese, brats, beer, fried foods, you get the picture. So I’m always really excited when I get to try a new place that’s feels a little like a spot I’d go to around here. 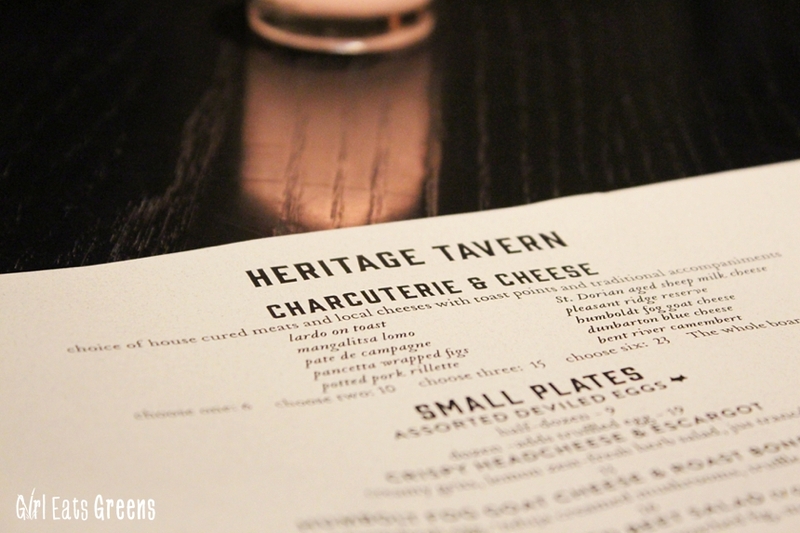 When my friend suggested we try a brand new restaurant called the Heritage Tavern, and described it as brand new and kind of hipster, I was all in. As I always do before going to a new restaurant, I checked them out online first. And I was a little nervous. This was upscale tavern food, and still predominately featured meats and cheeses as apps, fish and other meats as mains. But I was encouraged by a line below their menus that was really nice – “vegan and vegetarian options available upon request.” Score. Sign me up! 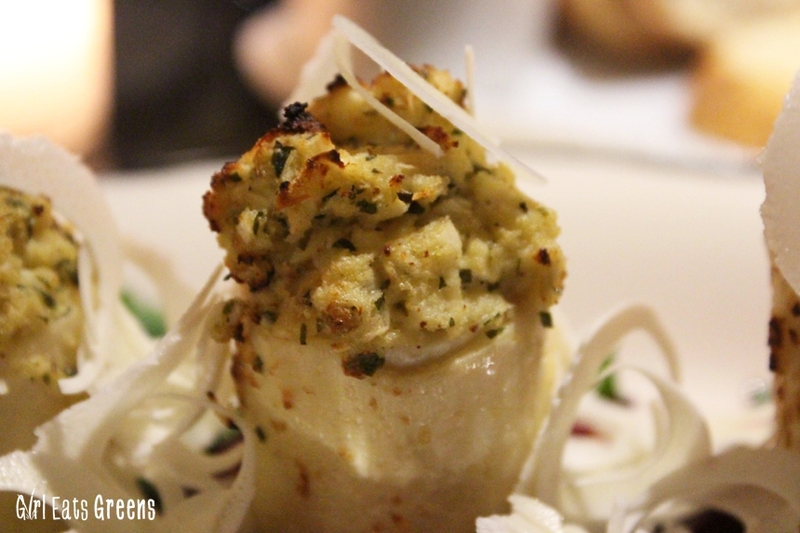 I ordered the vegetarian main dish that consisted of hearts of palm stuffed with breadcrumbs and cheese – and ordered it without the cheese of course. 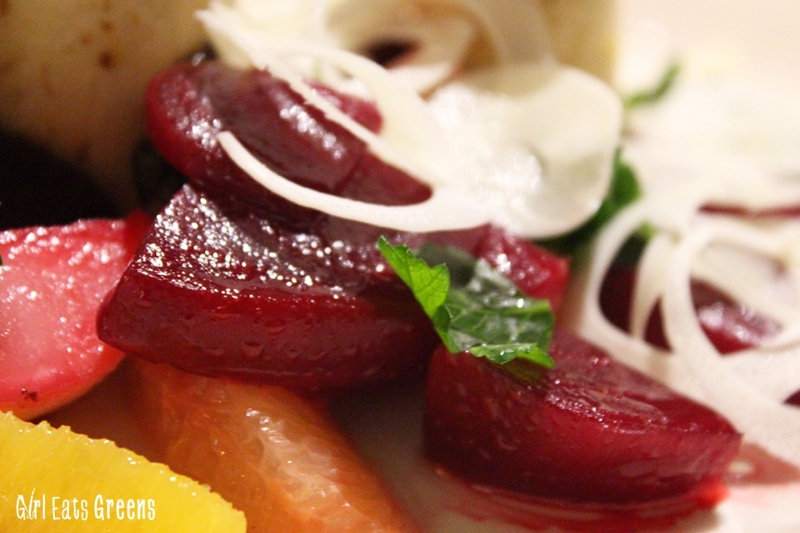 It came with a really delicious set of beets and grapefruit that gave the dish some much needed color and a bit more flavor. I would have been happy with just a giant beet salad, honestly. 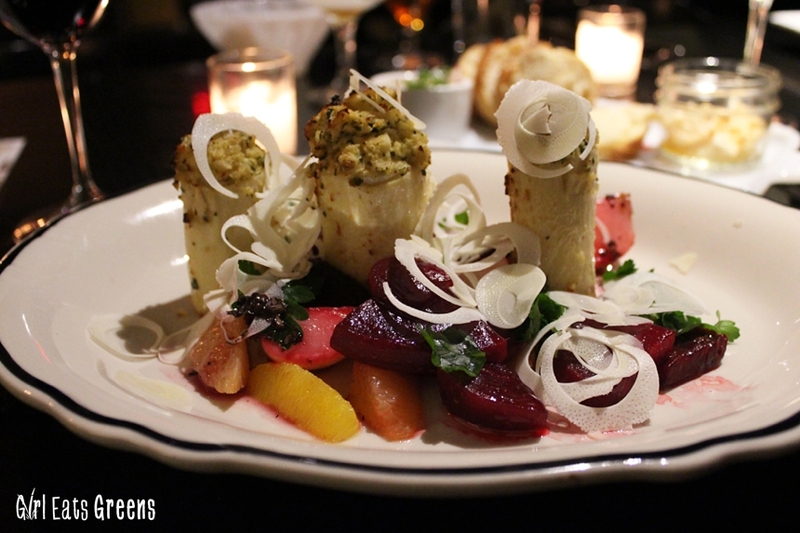 The hearts of palm were really well presented, really pretty, but they tasted like they were missing something. Probably because they were – the cheese. It was a little disappointing and kind of bland. I think if they had added anything (chickpeas? hummus? more green spice of some sort?) into the filling to make up for the lack of cheese, I could have had a great dish. We were so close! Now I must admit, we were there at least a few months ago at this point and I’m sure as a new restaurant they’ve worked out some of the kinks by now, but when we were there it was really apparent that they were new. We waited for a really really long time for drinks and table service at all for that matter. To the point that the hostess came to check on our table and ask us how everything was – and all we’d had so far was water. But the space is really cute and they definitely get an “A” for effort on food presentation and wine list, so if I end up back there anytime soon, I would give them another shot. Plus, they’ve got a great location and a short walk from a great view. Especially on cold, creepy nights. No picture of my fish??? Disappointed.. 😉 Great picture of the capitol though. Wow this place looks so delicious! 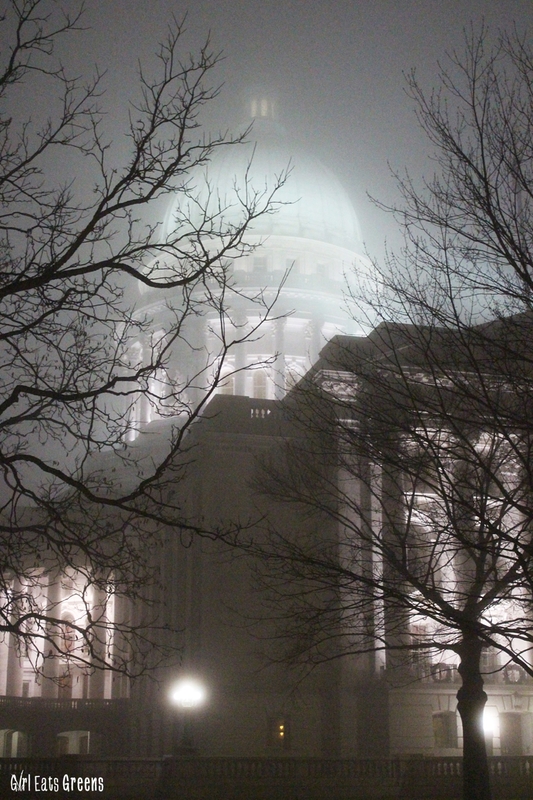 Makes me want to travel to Madison! Might want to wait awhile….the weather is horrid right now.